So, in a friendly (hmmmm...it wasn't really friendly...let's try civil) - so, in a civil Facebook wall conversation about health care and the Republican's view on such, I made a comment that a terribly sensitive, gentle-mannered republican took offense with - I called his party "Godless". 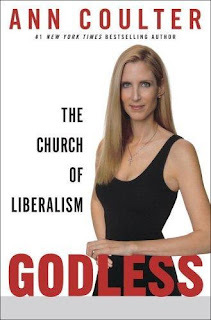 Yes, that's right; the Republican man-child poet laureate herself called the Dems "Godless" on the cover of her frigging book! So, not to be infantile, but - She started it! Still, I'd like to think that I'm better than Ann Coulter. Or, if not better...well...at least prettier. So, my thinking is, when you deny a health care option for millions of Americans that can't afford the current system, you are denying Christ. When you deny millions of Americans reasonably priced, life saving medications..when you make them choose between buying medicine or buying food, you are doing that to Christ. We are all God's children; not just the one's that go to your church, not just the ones in your tax bracket, not just the ones in your golf club. Some of us are dirty. Some of us are poor. Some of us are sick, or hungry, or afraid, or lost. Some of us are all of these things. All of us are children of God. And when you forget that, when you place more importance on the money in your pocket than you do on the citizens of this country, when profit is worth more to you than the people you are supposed to represent then yes; I will call you Godless. If you don't like that description, you can change it. The problem I have with Republicans is not that I don't like their plan - rather, it's that they have no coherent plan at all, save for the plan to block any Obama initiative, come Hell or high water. And therein lies the true issue - we are two parties looking for solutions to two different problems. The Democrats want something as close to Universal Health Care as we can get in this country, and the Republicans want Obama to fail miserably at anything he sets his hand to. Working together. Putting the needs of the nation as a whole above the needs of campaign contributors. That's how you do it. It's easy. Sure, it'll feel funny at first - you might get a little woozy or throw up in your mouth a little bit, but that will pass. You can do this. Both Democrats and Republicans can stop acting like parties and act like human beings, if only for a moment, and bring about real change. We are all Children of God, and as such, what we are capable of is extraordinary. Live up to the potential; live up to the words. Let us really, truly be One Nation, under God, Indivisible, with Liberty, and Justice For ALL. PS: In my research for this entry, I came across Matthew 25 Ministries, a non-profit organization doing some amazing work for those less fortunate. I've included a link to the right - check them out, contribute, volunteer if you like. Let's be Part of the Solution. Thanx.